Minivans are versatile. Are they truly adventurous? 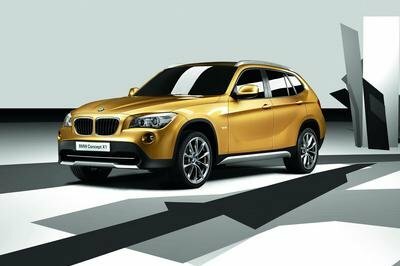 America’s favorite uncool family hauler does a great many things well, but those things tend to be limited to on-pavement activities, preferably in the suburbs or on the open freeway. This imaginative concept from Kia, displayed at 2015 SEMA Show, takes the minivan in an entirely new direction. Rather than being the cargo-hauler or the support vehicle, the Kia Sedona Photo Safari aims to get right in the middle of the action. The minivan has been re-imagined as a mobile shooting platform for wildlife photographers and fall color tour enthusiasts. After the addition of roof racks, camera mounts, lights, off-road tires and a radical roof-ectomy, this Sedona is a minivan with a mission. Kia envisions the Sedona Photo Safari as an “image-capturing machine,” and teamed up with LGE-CTS Motorsports for the build. Professional photographers provided input on the best modifications to make throughout the building process, and the result is a little bit safari, a little bit post-apocalypse and strange enough to be kind of cool. Continue reading to learn more about the Kia Sedona Photo Safari. 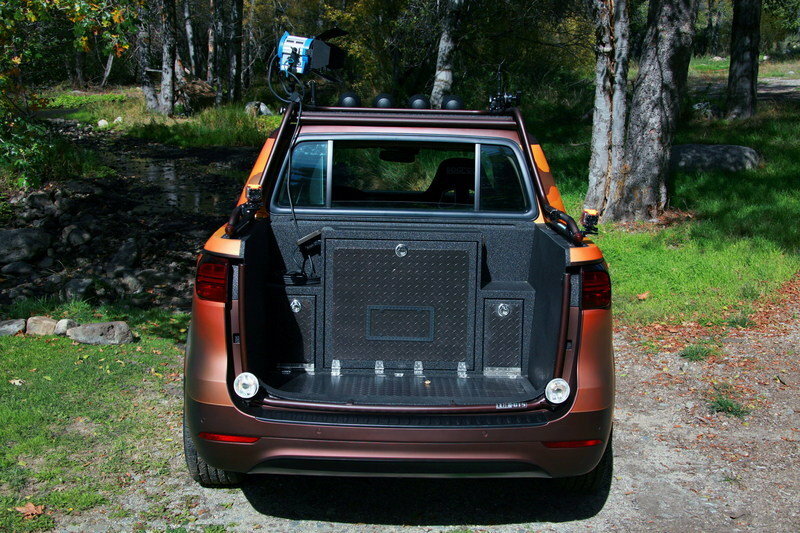 The rear of the Sedona Photo Safari has been chopped into an open cargo bed, giving it a distinctive minivan/pickup truck silhouette. 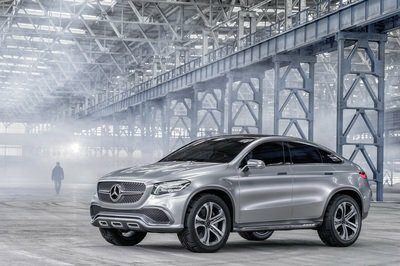 This hasn’t been done for shock value; the open bed contains gear boxes, under-floor storage space, exterior power outlets and a platform for low-angle photos, as well as providing an open-air platform to shoot from. With the tailgate long gone, the rear is permanently open, so the gear boxes are sealed and weatherproof, and the Sedona’s low load height makes it easy to step into the rear. The tubular steel roof rack is likewise multi-useful, with DSLR and action-camera jig and boom mounting points. It’s also strong enough to stand on, so the Sedona can serve as an elevated shooting platform. 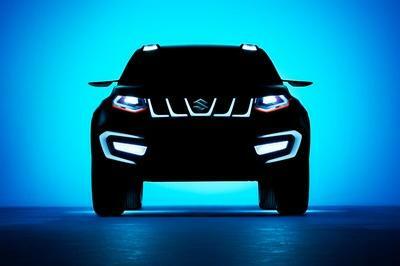 Six-inch KC HiLites LED lamps are installed front and rear to facilitate nighttime shoots. 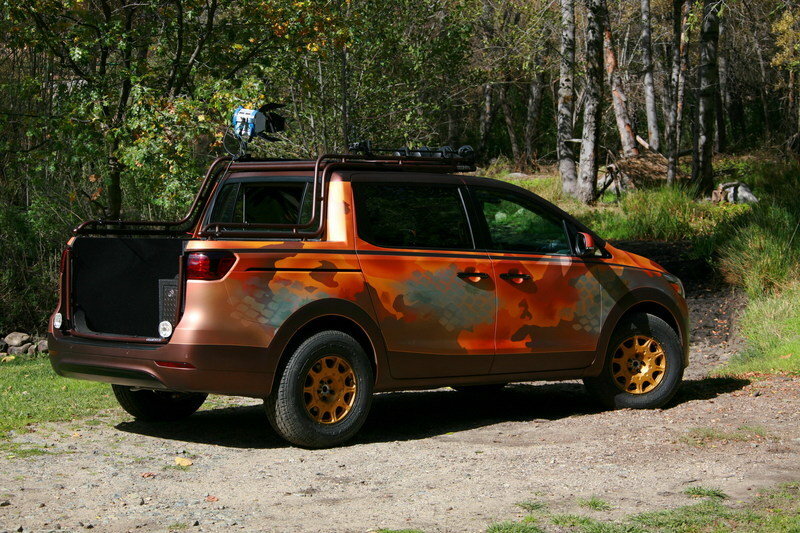 A Street Scene grille and custom lower front fascia are used, and the Sedona Photo Safari sports an orange, brown and yellow “autumn camouflage” paint job. Tall 265-series tires wrapped around 17-inch wheels raise the ride height enough to tackle back roads with ease. Capitalizing on the generous interior space offered by a minivan, LGW-CTS Motorsports removed the front passenger seat and one of the second-row seats to make space for an editing bay in the rear. This cozy mobile editing studio features a 27-inch iMac with a 5K retinal display, a walnut desk and real wood storage cabinets from Highline Cabinets. The rear seat is equipped with a racing harness and can actually slide up to three feet out the door for external shots. Driver and passenger communication is facilitated via headset. The editing equipment is powered by a military-grade battery that provides hours of power with the engine off. Meanwhile, the Sedona’s comfortable cockpit has been left intact and upgraded with new upholstery and painted trim for the benefit of the driver. The Sedona Photo Safari is powered by the Sedona’s 276 horsepower 3.3 liter V6 engine, and Kia doesn’t mention any modifications. In stock form, however, this engine provides spirited performance and quiet operation, though it’s a little thirsty on fuel compared to other minivans. More useful is the Hellwig auto-levelling airbag suspension, which automatically adjusts the ride height to adjust for loads. This Sedona rides a bit higher than stock thanks to the tall tires. 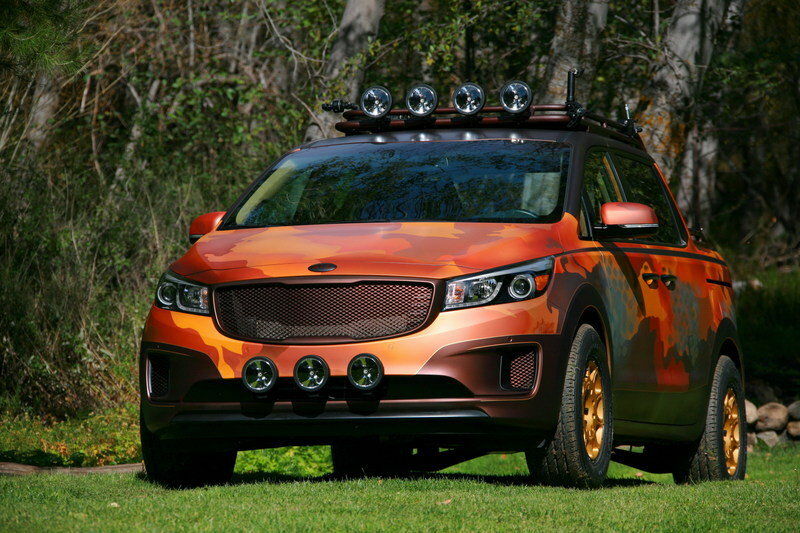 The Kia Sedona photo Safari is definitely one of the most heavily-modified and imaginative vehicles of SEMA 2015. By thinking both literally and figuratively outside the box, Kia and LGE-CTS Motorsports may have come up with a new vehicle segment entirely, albeit one with a very narrow appeal. Obviously there aren’t any plans to produce a similar vehicle, but it wouldn’t be surprising if someone decided to build a TV series around it. Across many regions of the U.S. during this time of year, nature puts on an awe-inspiring show of color. Brilliant red, yellow, and orange comingle with earthy caramel, auburn, and espresso, and nowhere is this riot of fall foliage more abundant and wondrous than the Northeast. The region has cast its iridescent lure to amateur and professional photographers for generations, and the Photo Safari Sedona has been designed to capture the region in all of its stunning beauty. Better yet, the vehicle would be an excellent companion on any photo safari. The Photo Safari Sedona takes the term multi-purpose vehicle to another level. What began as a standard eight-passenger Sedona minivan has been transformed to a two-passenger image-capturing machine. Designed and crafted by the creative team at LGE-CTS Motorsports with multiple custom features, this very capable on- and off-road vehicle can be put to the test with endless possibilities for photographers to capture and edit still images and videos – day or night – while traveling throughout the scenic Northeastern regions of the United States. Consulting with professional photographers throughout the build process, nearly every aspect and component of the stock Sedona was modified or enhanced. A custom fabricated tubular steel roof rack is utilized for mounting traditional DSLR cameras, a high definition WASPcam action sports camera system, booms, or jigs. It’s strong enough to support a photographer (or a brave production assistant), who can be secured safely to the outside of the vehicle via a safety harness and integrated mounting hooks. The rear bed area has been left open for easy accessibility and has multiple compartments for storage, exterior outlet ports, and a hidden compartment for lower angle shots. The Photo Safari Sedona is equipped with a Street Scene Speed Grille and a Hellwig auto level 2,500-lb. 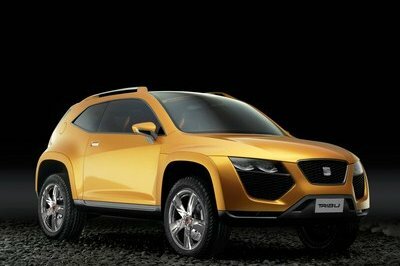 airbag suspension system that automatically adjusts ride height. Designed for use day or night, the Photo Safari Sedona incorporates ultra-bright 6-in. KC HiLites pro-sports gravity LED lights on all four sides of the vehicle. An easy-to-spot dash-mounted Daystar switch panel helps instantly turn a darkened glen to daylight. The Photo Safari Sedona has on- and off-road capability with Nitto Dura Grappler 265/65R17 tires wrapped around 17-in. Method “Rally” wheels bathed in a matte gold finish. The attention to detail continues inside with painted interior trim pieces and a custom upholstered driver’s seat. Removal of the Sedona’s middle seats help transform the vehicle to a rolling professional editing studio packed with the latest technology, including a 27-in. iMac with 5K retina display. The technology is backed up by a military-grade battery that will keep the studio running for hours without starting the engine. The battery automatically recharges once the Photo Safari Sedona is underway. A handcrafted walnut desk, extension-arm keyboard tray, and multiple storage cabinets designed by the master woodworkers at Highline Cabinets keeps the studio tidy. A custom Beard Torque racing seat with multi-point harness on an Extendobed allows the seat to slide out of the rear passenger door three feet, or be locked in place within the editing bay. Rugged RW wireless radio headsets provide uninterrupted communication between the driver and photographer, and a 30-in.power retractable rear window rolls down for added viewing capability. 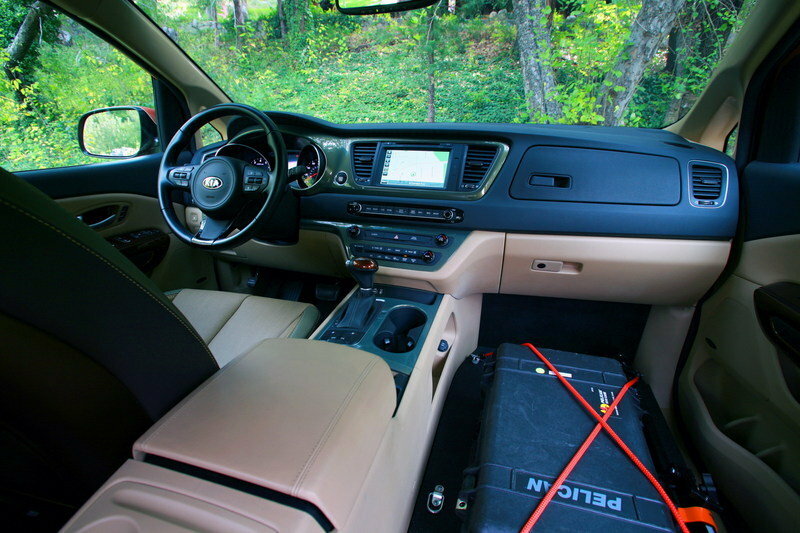 The removal of the front passenger seat creates room for large-item storage, and Mac’s tie-down mounts keep the equipment secure when the going gets rough.